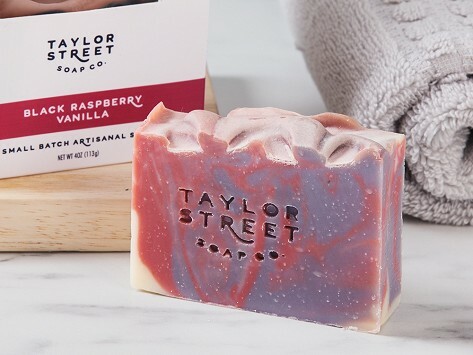 By Taylor Street Soap Co.
Artisan soap bars look as good as they smell (and feel). These bars are handmade in small batches in Chicago. They are made with a recipe designed to delight skin. Food-grade ingredients like olive, coconut, and avocado oil team up with tussah silk, oatmeal, and shea butter to leave skin feeling smooth and nourished. Paraben-, sulfate-, and phthalate-free. For extra moisture and luxury, the recipe includes tussah silk, colloidal oatmeal, and shea butter. Paraben-, sulfate-, phthalate- and palm oil- free. Dimensions: 3.25" x 2.7" x 1"
It was a valentines gift, and she loved the aroma. About Taylor Street Soap Co.
Baker-at-heart Rachel Wiandt of Taylor Street Soap Co. had dreams of mixing up cupcakes and cookies when she moved into a house with a second kitchen. The realities of running a bakery soon dampened that fire, so Rachel switched gears and began mixing up soaps instead—soaps that smell good enough to eat. They’re all made in Chicago by hand and in small batches. Rachel’s whipped soaps look like frosting and some of them smell like it, too. It’s a fresh approach to soap that feels more like body butter—rich and creamy. Her bar soaps just plain feel special. They are colorful and fragrant and because each one is made by hand, each is a one-of-a-kind. They are packed with good-for-skin food-grade ingredients like olive, coconut, and avocado oil, shea butter, and oatmeal. Either sudsy way you go, Rachel’s handcrafted approach is a fresh take on washing up.